signed and dated "Lyman / 29" (recto, lower left); inscribed "27" (verso, lower centre); inscribed in ink in an unknown hand, "Régattes [sic] à San-Sebastián / par John Lyman 1930" (verso, lower centre). sketch on reverse relates to St. Jean de Luz series. In September, 1929, John Lyman attended the famous rowing regatta which had been held since 1879 in the Bay of La Concha in San Sebastián, on the Basque coast of Spain. In May of that year, Lyman and his wife Corinne had moved into the La Chaumière villa in Saint-Jean-De-Luz, a fishing village they had often visited since 1926. On the second Sunday of the regatta, Lyman travelled the 27 kilometres to San Sebastián to lunch with the author and philosopher Marius Latour  whose house on Mount Igueldo offered a magnificent view of the shell-shaped Bay (hence its name La Concha, Spanish for “shell”) . From his mirador, or gazebo, one could admire the island of Santa Clara and the Castillo de La Mota perched on the hilltop of Monte Urgull which closes the bay towards the west. In a few brush strokes, Lyman captures the festive atmosphere of the Bay of La Concha on a bustling regatta day. He paints the spectators of the competitions in small dabs of colour stretching in a line across the beach. Beneath a cloudy sky, other bright touches evoke swimmers seeking cooling refuge from the humidity which had been particularly stifling on the coast that summer . Further offshore, the four competing rowboats are speeding along, surrounded by a variety of boats in the harbour that day: barges, canoes, motor boats, sailboats and a ship flying a Spanish flag. 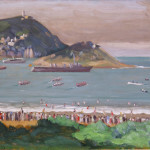 John Lyman painted The Regatta at San Sebastián two years before his permanent return to Canada in 1931. In 1913, the artist had rushed to leave the country after an exhibition of his modern works at the Art Association of Montreal had not been well received and caused somewhat of a scandal. Exiled for nearly 18 years in Europe, he would often escape from the cold Parisian winters, favouring the gentler climates of the Mediterranean coast, of Tunisia (1919-1922) and Cagnes-sur-Mer (1923-1924). But from 1926 onward, John and Corinne preferred the Atlantic coast. Until 1931, they spent extended months in Saint-Jean-de-Luz, making frequent excursions into Spain. 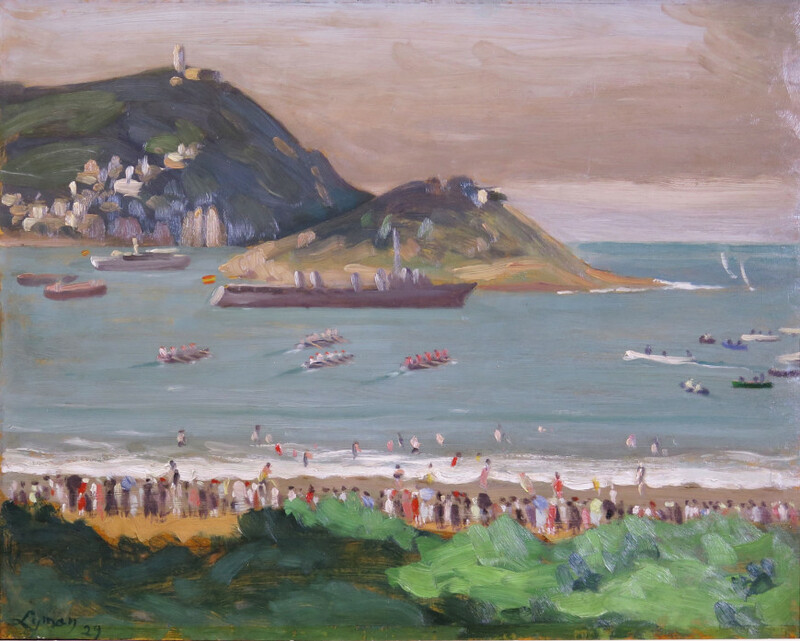 Verso of Regatta at San Sebastian: Sketch for On the Beach (Saint-Jean-de-Luz), 1929. 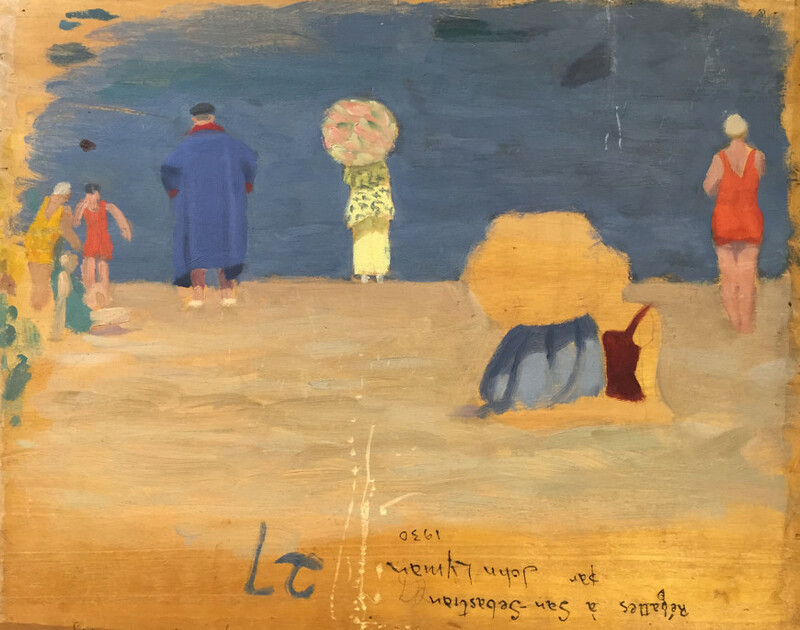 On the back of the small panel, we discover an undocumented sketch for On the Beach (Saint-Jean-de-Luz), one of John Lyman’s masterpieces (previously sold by Galerie Walter Klinkhoff). This oil sketch is one of several similar ones already known and which are held along with the finished painting at the National Gallery of Canada . The uniqueness of this sketch, however, is that it contains a draft of the principal theme of the final painting, namely the couple sitting on the beach beneath a bright red parasol. Close scrutiny of the other figures in the small study reveals the silhouette of the swimmer in a red bathing suit who, in the finished painting, is entering the water at the right in the composition. The woman standing with a light parasol in the sketch also appears in the finished painting at the extreme left-hand of the composition, partially hidden by the gendarme. This sketch offers a most important insight into the creative process of one of Lyman’s finest paintings. A few months before the artist’s permanent return to Montreal, W. Scott & Sons Gallery presented an Exhibition of Paintings by John Lyman from February 21 to March 4, 1931. 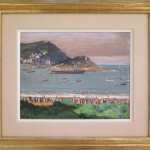 Among the 39 works exhibited were four views of the beach at Saint-Jean-de-Luz (nos. 28-31) as well as the Regatta (San Sebastián) (no 27) . To our knowledge, this was the only public showing of this small painting. John Lyman never tired of painting beach and regatta scenes. They inspired remarkable pieces he painted in Quebec (The Beach , Lac Ouimet, c.1939; Boat Club, North Hatley, 1948), on the American coast (The Main Beach, 1957) and in Barbados (The Lobster Trap and Hauling up the Fishing Boat, 1962) . We thank Michèle Grandbois, Ph.D. for this appreciation. Michèle Grandbois was the curator of Modern Art at the Musée national des beaux-arts du Québec (MNBAQ), where she worked for 28 years (1986 to 2014). She has authored many books and essays on modern and contemporary art, has curated over 32 exhibitions and produced a dozen catalogues. Most recently, she curated the exhibition 'Morrice and Lyman in the Company of Matisse' (2014) for the the MNBAQ, which also traveled to the McMichael Canadian Art Collection in Kleinburg, Ontario. She twice received the Prize for Excellence in Research from the Association of Canadian Museums. © This contents of this page are protected by copyright. 1. Lyman had just read Marius Latour’s Premiers principes d’une théorie générale des émotions (1912) on which the author had been working towards its second edition, to be published in 1936: “Have almost finished M. Latour's Théories des Emotions. If he has the energy to do it over & present it in a way that will force attention, I think his name will go down with those of the great philosophers & psychologists.” John Lyman, « Journal. August 11th. », Unedited by John Lyman, choice of texts and annotations by Hedwidge Asselin, Montréal, Ministère des Affaires culturelles / Bibliothèque nationale du Québec, 1980, p. 69. 2. « Last Sunday went to St. Sebastian. Painted the regatta in the concha from M. Latour's mirador, & lunched with him. » John Lyman, « Journal. 21 st. ». 3. « In point of weather this has not been a very good season. While most of Europe was suffering from drought, the Basque Coast was rather damp. Considerable rainfall & a great deal of sultry weather. Only at the end of August & beginning of September did we have a period of any duration characterized by fine weather. Lately it is so damp that mildew invades de cepboards. » John Lyman, « Journal». 4. 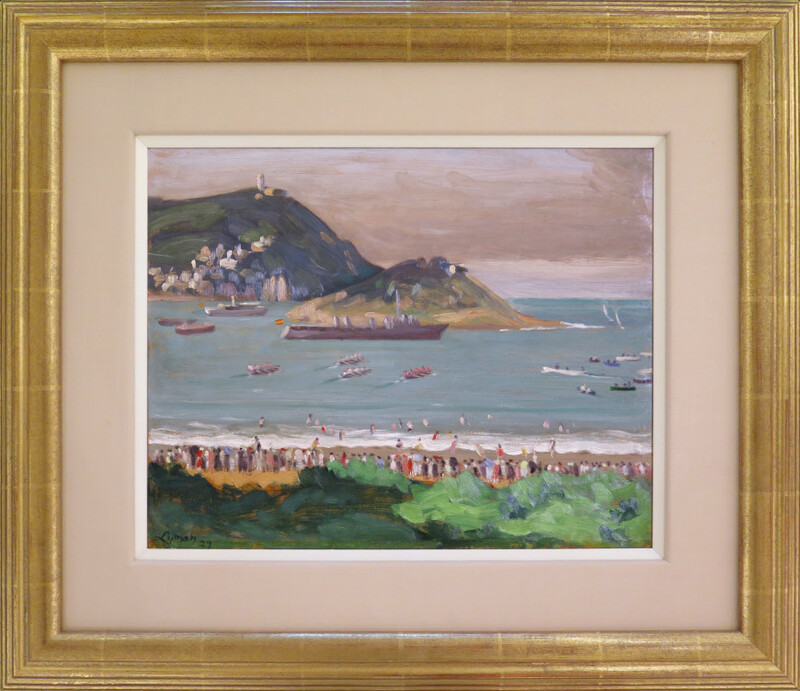 À la plage (Saint-Jean-de-Luz) and the two known sketches were acquired from the estate of Dr. Max Stern, owner of the Dominion Gallery in Montreal. The three works were bequeathed to the National Gallery of Canada in 1988. In many catalogues they have been erroneously dated 1926. 5. The inscription “27” on the back corresponds to the exhibition number of the painting. 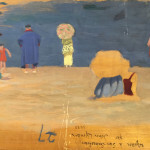 Another inscription « Régattes [sic] à San-Sebastián/par John Lyman 1930 » seems to be written in a different handwriting than the painter’s who signed and dated his painting on the back, bottom right: « Lyman/29 ». 6. I would like to thank Nicole Gastonguay and Nathalie Thibault of the Musée national des beaux-arts du Québec for kindly providing me with references facilitating my research for this text.